Published in “ISME Journal“(Online Publication, January 30, 2018). The activity of marine viruses shows diel cycles. The team co-led by Hiroyuki Ogata (Institute for Chemical Research, Kyoto University), Takashi Yoshida (Graduate School of Agriculture, Kyoto University), Yosuke Nishimura (Tokyo Institute of Technology), and Keigo Yamamoto (Research Institute of Environment, Agriculture and Fisheries, Osaka Prefecture) has elucidated such daily rhythm of viral life in the sea. Their results suggest that viruses are indispensable for the stability of the population of marine photosynthetic bacteria, cyanobacteria. There are 1030 viruses in the oceans. In a cup of seawater, there are billions of viruses floating inside. Indeed, viruses are the most numerous living entity in the marine environment. Through lytic infection to bacteria and algae, viruses kill these microscopic plankton, and consequently they drive the turn-over of marine plankton and cycling and recycling of organic and inorganic matters. However, the ecological role of various viruses existing in the sea is still poorly understood. The collaborative research group sampled seawater at the entrance of Osaka Bay, Japan, during a period of 24 hours and generated a large amount of genetic data from viruses in the samples. The approach taken by the group is outstanding by monitoring both DNA and RNA from viruses in wild at the same time using a high throughput sequencing technology. Figure 1. Marine viruses under epifluorescence microscope. Green dots represent viruses. The research group first revealed that viral particles relatively abundant in the samples were produced through infection that occurred at the time of sampling during the period of 24 h. In short, viruses in Osaka Bay are “local and fresh” products. This result thus questions an alternative view that viral particles could be distributed in wide areas of oceans through sea currents. Further analyses of DNA and RNA genetic data revealed a time delay between viral transcriptional activity and viral production. Moreover, viruses infecting photosynthetic bacteria showed high transcriptional activity during the day time, followed by a massive production of viral particles from midnight to dawn. 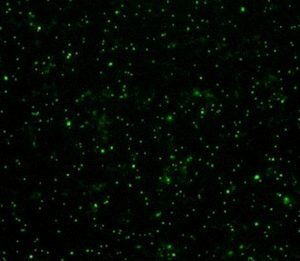 Researchers in the US previously revealed that the stability of the population of photosynthetic bacteria is due to their high mortality rate in the night. However, the cause of the mortality has been unclear. The results from the study of Osaka Bay samples evidenced that viruses are in fact an important driver of the diel motility of photosynthetic bacteria, which produce about 25% of oxygen that we breathe. This means that marine viruses may play a key role for the stable existence of photosynthetic bacteria and for our life. In the coming years, the collaborative research group will focus on phenomena such as red tides, where plankton communities dramatically change, in order to further elucidate how viruses regulate microbial population dynamics in the sea. This effort will likely open a new domain of science, “Viral Oceanography”, aiming to understand marine environments through monitoring viruses. Figure 2. The activity of viruses infecting photosynthetic bacteria in Osaka Bay. The tail of an arrow (marked by a circle) indicates a high transcriptional activity, while the head of an arrow correspond to a time when viral particle production is high.